Brian Bartow of Lake Oswego, Ore., has dominated pole climbing the last ten years of the Lumberjack World Championships. Held in Hayward, Wisc., during the final weekend of July, attendees became accustomed to the lanky Bartow taking title after title, year after year. Bartow’s first win on the 60’ poles came in 2004. From then through 2010, he consistently took the gold with the exception of 2007, when Cassidy Scheer of Decatur, Ga., was crowned 60’ champion. The 90’ poles from 2004 to 2009 were also Brian’s. The 2010 competition ended with a spectacular performance. He came in second to Stirling Hart of Missions, B.C. by only .03 of a second. A repeat matching of Hart and Bartow was expected, but it was not to be, as circumstances prevented Brian’s return. But some of his records remain untouched. Stirling Hart, from British Columbia, still holds a pole record, but came home this year with two 2nd place winnings and a 4th place. 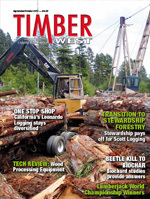 The 52nd edition of the Lumberjack World Championships was hosted by a new pair of sponsors: John Deere and Nortrax. Cassidy Scheer tried to beat Bartow’s 60’ record of 12.33 seconds set in 2005, but he came in at 12.81. Hart wasn’t far off the mark with a time of 12.99. Third was held by Derek Knutson of Hayward, Wisc., who registered 13.45 — less than a full second behind Scheer. That would change. Saturday saw Knutson finish behind Hart once again but this time, by scarcely more than a quarter second; 13.17 to 13.43. Scheer, meanwhile, had slid all the way to third with a time of 13.79 seconds. Finishing Sunday’s final heat in 12.80 seconds, Scheer posted the best time in the event, surpassing his opening round time by 1/100th of a second. Hart, meanwhile, slipped just enough on the way up to come down in his slowest time of the weekend: 13.52. Once again it would be Cassidy Scheer’s name supplanting that of Brian Bartow’s in the chronology of 60’ champions. No one would come close to Hart’s 2010 record of 19.64 on 90’ of wood. But setting a new record isn’t necessary to win an event. The same principle held true in pole climbing. With three heats, there would be a different leader, but Hart was well down the line (7th), at 37.84. Despite that disappointing time, Hart was there at the end. Once again getting the west pole while Scheer used the one to the east, both men turned in their best times on 90’ for the weekend. Even so, it wasn’t dramatically close at the end as Scheer was down at 21.28, but Stirling Hart didn’t hit padding until more than 1½ seconds later — 22.91. To his credit, Hart entered other events as well. Participating in the Men’s Underhand Chop, he just missed the semi-final cut by posting a time of 25.03, about a quarter-second behind Matt Slingerland’s (Rockwell, N.C.) time of 24.74 on a 12” aspen log. The same script was evident in the Standing Block Chop as Hart tallied 32.45 but was behind the 8th place showing of Jason Lentz (Diana, West Virginia) with 31.14. It was a disappointing show for the young British Columbia, Stirling Hart, in that he did not win any events. Still, two 2nd Place finishes and a 4th meant Hart didn’t go home with empty pockets. He will be back. Already the slivers and springboards are calling him.